RailStaff first reported on Brightboot’s new wellington boots in March when they were showcased at Safestart. The boots combine the traditional protection offered to a wearer’s feet with the use of hi-vis materials to increase visibility. Marcus Aldred, managing director and founder of the UK-based manufacturer, said that when trousers are tucked into boots, a significant amount of the lower body can be left unmarked by hi-vis. He has overcome this problem with this new range of boots for men and women, which was launched in 2018. Whilst there are some safety boots that do increase visibility, Brightboot research found no such product that provides 360 degree hi-vis, day and night, existed in the UK. No standard currently exists for hi-vis footwear but the neoprene material incorporated within the boots is compliant to a number of standards, including EN ISO 20471, the European standard for hi-vis workwear, and the orange boots also meet the specification of RIS-3279-TOM, the rail industry standard for hi-vis clothing. Marcus worked in the textile industry for 25 years, mainly out of Asia working with hi-vis yarns and fabrics, before joining the family wellington business Rockfish around five years ago. 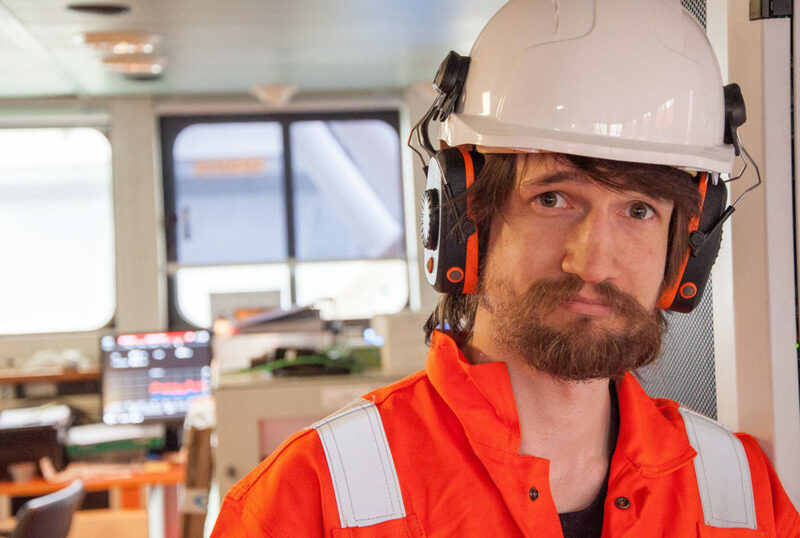 The decision was later made to enter the PPE market, combining the two things Marcus had great knowledge in: hi-vis materials and rubber, to produce Brightboot. After two years of development, a soft launch took place at the Safety & Health Expo in 2018, although this was largely an information gathering exercise. An official launch took place mid-January. 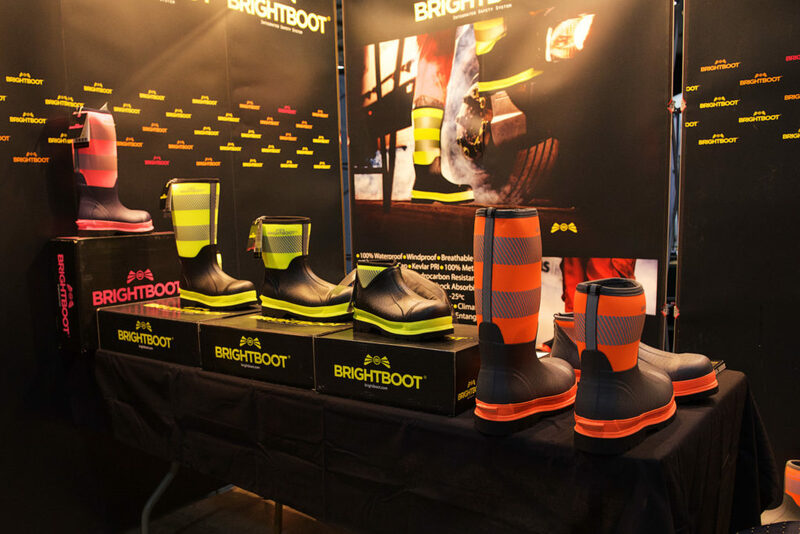 Already Brightboot is in conversation with suppliers such as Arco and Hayley Group and the product has been shortlisted in the British Safety Industry Federation’s (BSIF) Product Innovation Award. The boots come in three different sizes: tall, mid and low, and in three different colours: orange, yellow and pink. They are also 100 per cent waterproof and metal free. Although Marcus was remaining tight-lipped, he said other versions of Brightboot will be released later in 2019. Last year’s winner of the BSIF Product Innovation Award was Eave’s Work Mk1 communication headset. The product, which – similar to Brightboot – was also its launch product, builds on the protection offered by traditional ear defenders by allowing workers to communicate to each other without removing the headset by speaking via Bluetooth connected headphones and mics. The Bluetooth connectivity isn’t the innovative part however, it’s the noise reporting system which measures, maps, monitors and records the user’s exposure to dangerous levels of noise, as well as the location and time to help employers mitigate noise risk. Founder David Greenberg explained the product goes back to solving a problem he regularly encountered working as a clinical audiologist for the NHS with people who had lost their hearing. He said there are two main reasons people lose their hearing: old age (although this is a bit of a misnomer) and through working in noisy environments. “I would say ‘Surely you had hearing protection? Were you not wearing it?’” he added. “They would say that I can’t really wear hearing protection if I need to communicate with colleagues. So that was a bit tricky. After that I got involved with the medical legal side of noise induced hearing loss related to the control of noise at work regulations and understanding the liabilities of employers and employees. “Being an expert witness for these kind of things you suddenly find you don’t have any data as to was this person working for employer A or B, were they wearing ear protection, what was the noise they were exposed against to 10 years ago, 20 years ago, 30 years. Equally, is the hearing loss due to what they were doing at work or what they were doing in the evenings and weekend. There was no information on this sort of stuff, it was impossible. Much-like how hand arm vibration syndrome has attracted more and more attention in the industry, David sees hearing loss gaining traction to become a more important issue. He appreciates, however, that it is more difficult to notice the damage being caused by loud noise. Launched back in June 2018, and having been tested by BAM Nuttall, a new version of the product is already being developed, but Eave is keeping it under wraps. 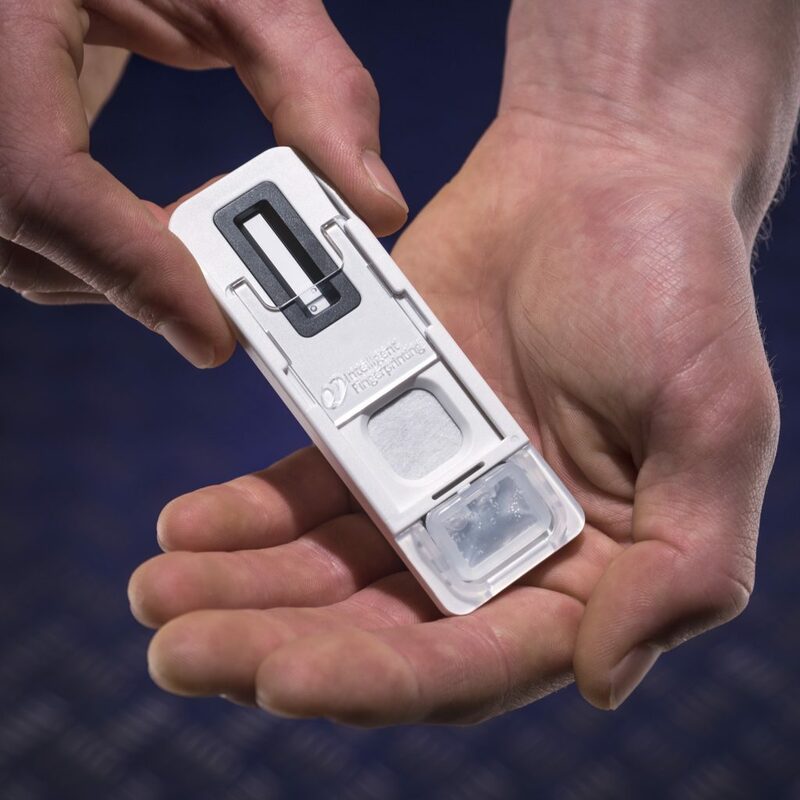 Sweat instead of urine or saliva is used in a new portable fingerprint drug test developed by Intelligent Fingerprinting, which is being marketed by Rowe Hankins. The test analyses sweat from fingerprints to determine if someone has recently used cocaine, opiates, amphetamines or cannabis and can be used to support non-regulated drug testing. Rowe Hankins managing director Mike Hankins said the fingerprint drug test – which was launched in August 2017 – can provide results in minutes. He added: “The UK railway sector, quite rightly, has a zero tolerance on employee drug and alcohol usage. This is to ensure the safety of passengers on public transport as well as staff across the networks. Drug testing is widespread, however current testing relies on potentially invasive and biohazardous approaches that use urine and saliva. Additionally, common testing practice is highly disruptive and this has an impact on efficiency. Many accidents occur from workers stepping too close to vehicles or plant. Fhoss’ exclusion zone light is a safety solution created to curb this problem, creating a clear visual prompt of where an exclusion zone begins around the moving vehicle. The light beams are hard wired into the vehicle or plant and come in three different colours: red, green and blue, as well as three types of halo zones: spots, strips and directional arrows. 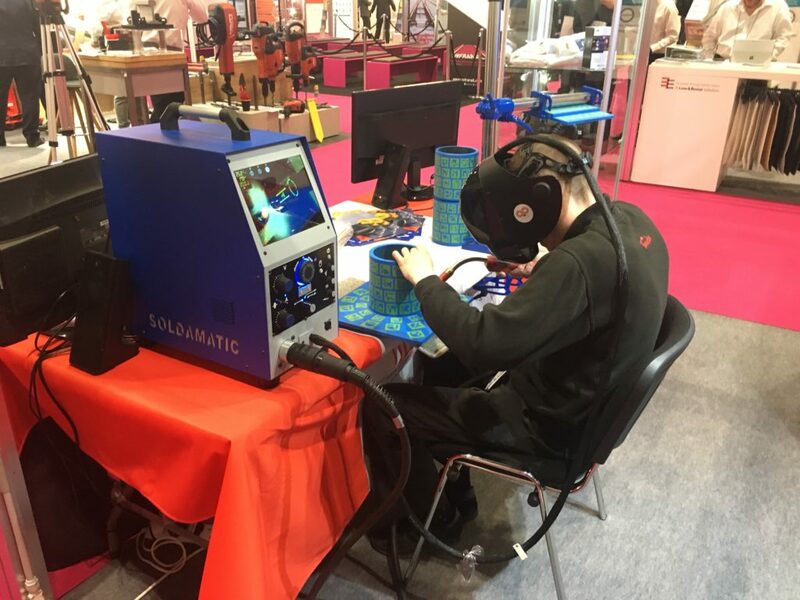 Back at Infrarail in 2018, engineering solutions firm Flamefast exhibited Soldamatic, an augmented reality training system that aims to reduce costs while increasing the training efficiency for welding. The system allows welding trainees to repeatedly practice their technique in the virtual world without any additional costs, as they’re in essence ‘welding’ pieces of plastic with a simulated welding torch. What the trainee and instructor see is a 3D image of what a real weld would have looked like. By training in the simulated environment, it minimises the risk to things such as welding flash and extreme heat, as well as minimising gas emissions. Soldamatic can enhance the learning process for students so they are skilled enough before going to the real workshop. Soldamatic also claims that, compared to traditional techniques, the augmented reality training reduces a trainee’s learning time by more than 50 per cent and results in significant reductions in accidents (84 per cent) and lab costs and environmental impact (68 per cent).